Color accuracy refers to a TV’s ability to display the exact color tones or shades of gray demanded by the signal sent by the source device. In terms of what you see, this could mean the difference between an object that is meant to be red actually appearing red, or maybe looking orange-red. 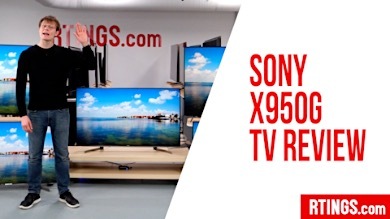 The accuracy of color affects all video displayed on the TV. 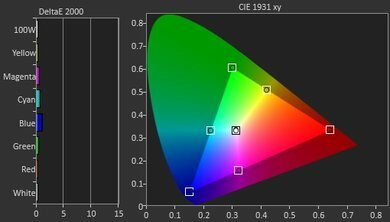 When evaluating color accuracy of TVs, we measure the white balance dE, color dE, and gamma. We do this once with only a couple of settings adjustments, and then once after a full color calibration has been completed. 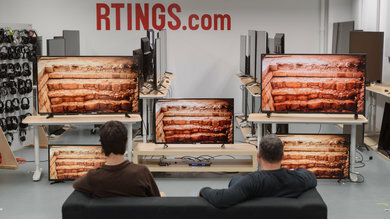 This lets us get an idea both of how good a TV is more or less out of the box, and also how good it can be when a full calibration is done. 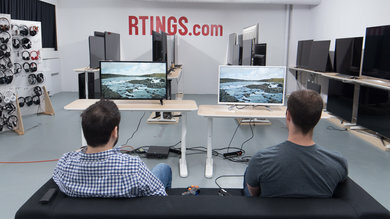 Note: Because full calibrations cost a good deal and don't offer much improvement over just using the right settings, most people shouldn't bother getting them. Different levels of inaccuracy will be noticeable by different people. 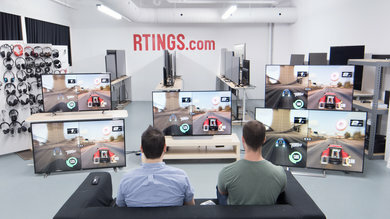 To compare the TVs in our test results above, refer to this table, which explains how the different scores play out in real life. 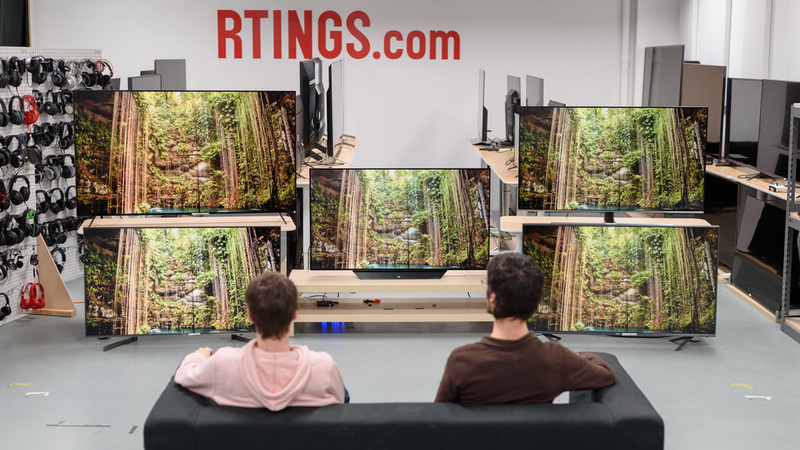 Color accuracy affects all video the TV displays, so no matter what you watch, it is an important part of the overall picture quality. 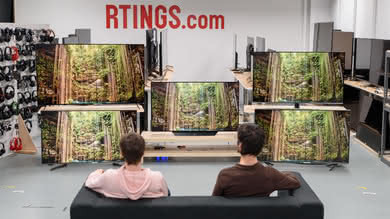 We score two different kinds of color accuracy, pre and post-calibration, but because most people don’t calibrate their TV’s color, we consider the pre-calibration accuracy to be the most important thing to look at when comparing TVs for color accuracy. 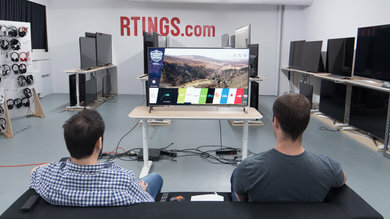 It’s also worth noting that pretty much all TVs will score the same for post-calibration color, making that score less useful for comparing TVs. 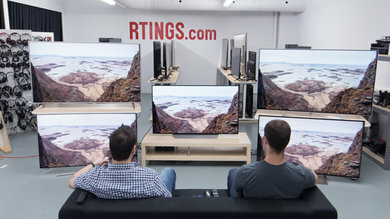 For pre-calibration, we evaluate TVs for how good their picture quality is with only a couple of settings changes. 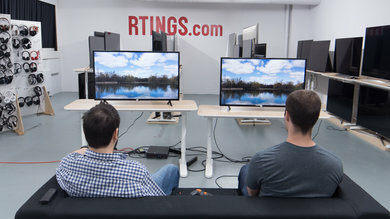 This score matters if you don't plan on getting a full calibration done, and though it isn't the worst thing in the world to get a TV with poorer pre-calibration color, it does make a bit of a difference. 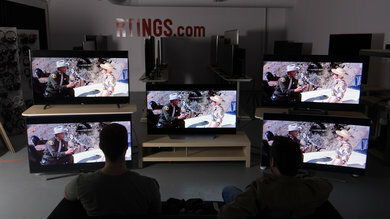 This overall score comprises the scores a TV receives for white balance dE, color dE, and gamma, before the TV is calibrated. 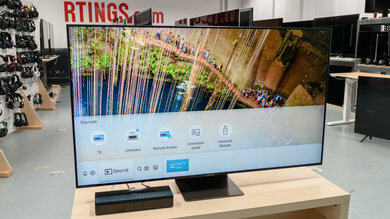 It is not done on the TV straight out of the box, though. 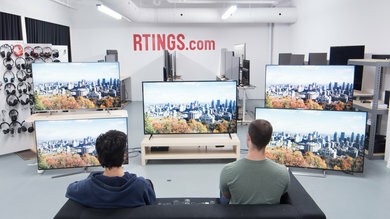 Before measuring the color accuracy, we make the following settings changes, which make the color reproduction more accurate than what you get with the TV’s default settings. Switch the color temperature to the warm setting if it is not already selected in the 'Movie' or 'Custom' picture mode. Adjust the backlight. We adjust so that white emits light at a brightness of 100 cd/m2, which is ideal for most dark room situations. Change the contrast to the maximum safe setting. 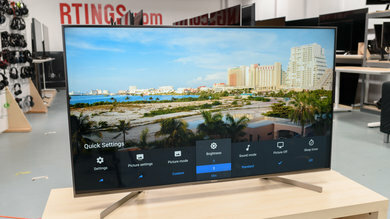 We don't do this for most TV brands, as in the good picture mode the contrast is usually set well, but for some brands like LG, we increase the contrast to the maximum setting that won't have clipping on anybody's unit, such as increasing contrast from 80 to 90. Change the gamma setting. 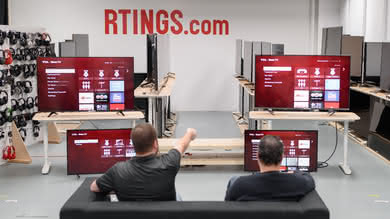 If the TV has a gamma setting we set it to the most accurate setting for that brand, that is accurate for anybody's unit. 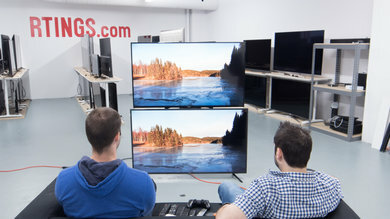 Our post-calibration evaluation is an overall score for the quality of a TV's picture quality after a full-color calibration has been done. 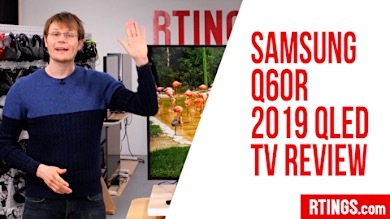 This score will give you an idea of what to expect from your TV if you do plan on getting a calibration done, though as most TVs end up having about equally accurate color once calibration is done, these scores aren't quite so important. 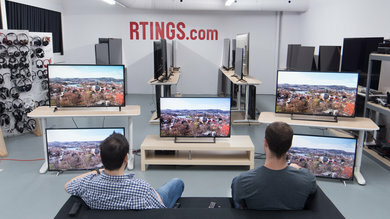 The post-calibration score is an overall evaluation based on the scores a TV receives for white balance dE, color dE, and gamma after the TV is calibrated. The calibration process is as follows. After completing our pre-calibration analyses, we begin making adjustments to the TV’s white balance settings to improve accuracy. If a ‘2 pt.’ option is available, we will begin by making adjustments to that before proceeding on to the 10 pt. or 20 pt. options. Gamma is affected by the adjustments made during this process, and so it is adjusted at the same time. 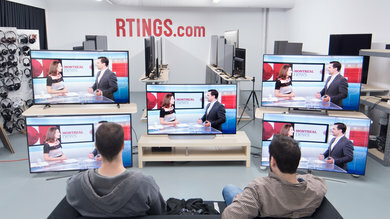 Once we have calibrated the TV’s white balance settings and gamma, we then adjust the color dE by correcting the appearance of red, green, blue, yellow, magenta, and cyan. After the white balance dE and color dE are adjusted, we display a gradient to ensure there is no unexpected color banding or any other undesirable artifact. The white balance dE determines how accurately a TV can display different shades of gray, which range from white all the way to black. The white balance dE affects the overall color temperature of the entire picture, though issues will be most apparent with different shades of gray. In the above grayscale gradient, you can see a fairly dramatic example of how an imbalance in color composition affects a particular shade of gray. The 70% and 80% shades both have a good deal more red than they should, and this throws off not only their own appearance but also the way they interact with close shades. To compare the difference between high (bad) and low (good) white balance dE for regular pictures, take a look at the following images. 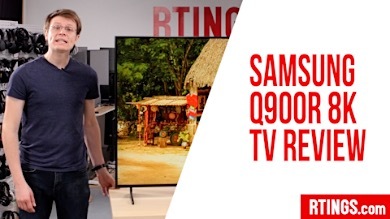 You can see that even a bad white balance dE isn't the end of the world when it comes to the overall picture, so this isn't the biggest problem a TV can have. To test for white balance dE, we use a Colorimetry Research CR-250-RH spectrophotometer (connected to PC via USB) to analyze the accuracy of a series of shades of gray produced by the CalMAN 5 for Business software and displayed on the TV. 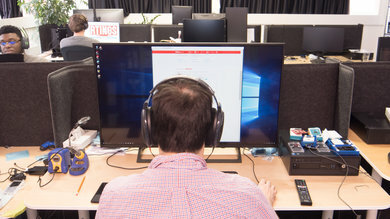 Each shade is displayed on a window that takes up 18% of the screen. The lower the average dE for all the shades, the better. We perform this measurement one-time pre-calibration, and once post. Note that our dE measurement of the white balance represents an average of the dEs of 10 different shades of gray (from 10% at the darkest end, to 100%, which is white). A given shade may, therefore, have better or worse dE than the others. 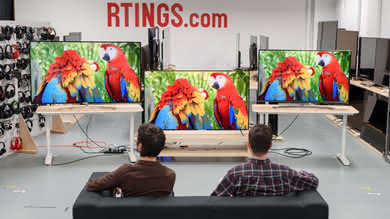 Our color dE measurement expresses how accurately a TV can reproduce the following colors: Red, Blue, Green, Yellow, Magenta, and Cyan. Generally, if a TV can reproduce these six colors accurately, the overall color accuracy for the rest of the color tones will also be good, so this is relatively consequential. However, since most people aren’t going to notice anything but extreme deviations from accurate color, the results aren’t something to be too concerned about. 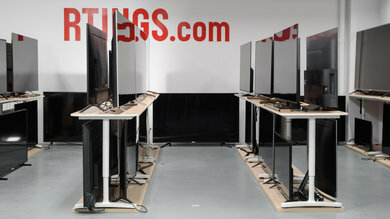 To compare, here are TVs with high (bad) and low (good) color dE measurements. To evaluate color dE, we use our spectrophotometer to analyze the accuracy of six colors produced by our calibration software and displayed on the TV: red, green, blue, yellow, magenta, and cyan. Each color is displayed on a window that takes up 18% of the screen and displayed at points of 20%, 40%, 60%, 80%, 95% and 100% saturation, and 75% stimulus. The lower the average dE of all the colors, the better. As with the white balance dE, we measure this once pre-calibration, and once post. 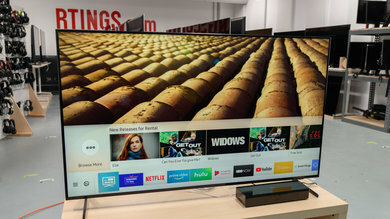 Note that the dE we list for each TV represents an average of the dE for all colors, meaning some colors may be more or less accurate than the overall number suggests. It’s also worth noting that because we only test the 100% saturated colors, less saturated colors may be a bit less accurate, but these results won’t appear in our score. We display all colors at 75% stimulus. Gamma is an expression of the luminance of a particular shade or color, so when calibrating a TV’s white balance, achieving a flat gamma line means the luminance of that particular shade is exactly right for the target look. If the line curves up above the target, it means the shade is darker than intended, and you run the risk of losing detail in the shadows. Below the line means the shadows are lighter, though the difference there is less apparent. This is fairly important, as differences in gamma are pretty easy to notice. 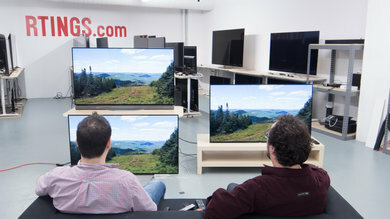 Below, compare a TV with gamma that is too high (left) with gamma that is correct (right). The gamma is evaluated at the same time as the white balance dE, so once each pre and post-calibration. 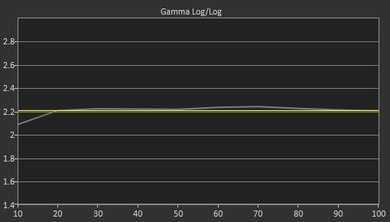 Our spectrophotometer analyzes the gamma level of the series of shades of gray produced onscreen, and the closer the average gamma is to our target of 2.2, the better. Both for white balance and color reproduction, dE, which is the measurement of how different one color is from another, is very important. The exact calculation we use when measuring this difference, dE2000, can be found here. Because it measures the distance between two given color tones, dE can also be used as a measure of color accuracy on TVs. 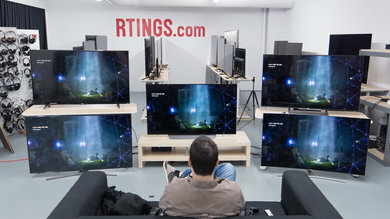 If a given color or shade of gray is reproduced perfectly by a TV, the dE measurement will be 0 (zero). The larger the dE is, the farther the reproduced color is away from being correct, and the less accurate the image being produced will be. We target a dE of under 0.5, which equates to an unperceivable difference. One minor shortcoming of dE as a measurement of color accuracy is that it only expresses the amount of difference that exists between the reproduced color and the target color, and not what the perceivable difference is. 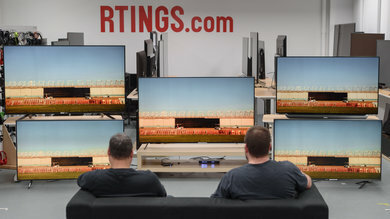 For example, when calibrating the color ‘Red,’ one TV might produce a red that is a bit too pink, and another might produce a red that is a bit too orange, but if each is the same ‘amount’ different (same dE), they will score the same. They are equally inaccurate, but what you actually see is not the same, and one might be subjectively worse. 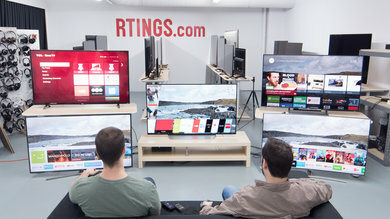 A full professional calibration (or buying the necessary equipment and doing one yourself) is the only way to ensure your TV’s color is as accurate as possible. Unfortunately, both professional assistance and an entry-level kit for doing your own calibration cost around $250. 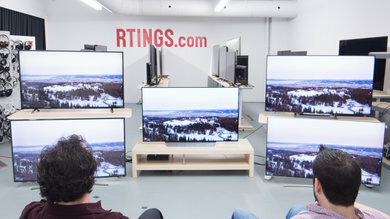 For cheaper TVs, this would represent a very large portion of the cost of the TV itself, and higher-end models tend to have pretty accurate color anyway, meaning a calibration wouldn’t be much benefit. 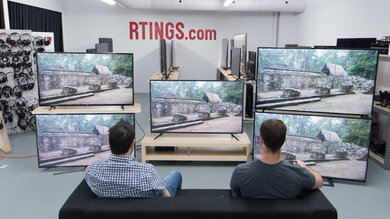 Just changing the picture mode (use ‘Movie’ or ‘Custom’) and setting the backlight to a comfortable level will make a big improvement to your TV’s color, so unless you have the extra money and don’t mind a pretty minor improvement, we recommend against getting a calibration. 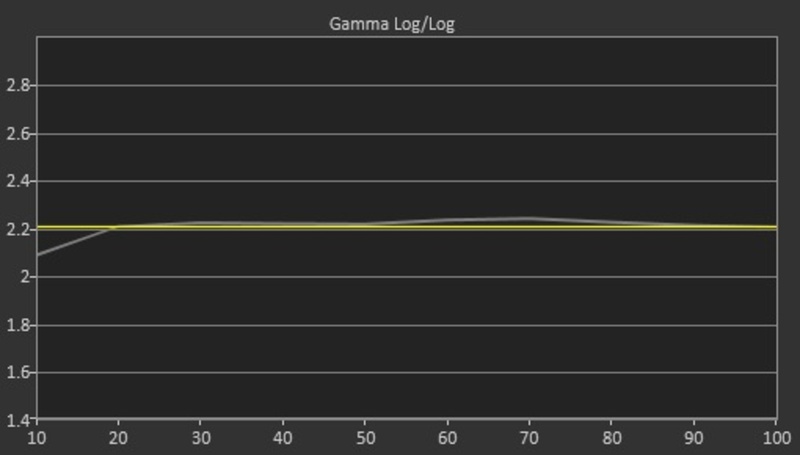 You should also note that our gamma target of 2.2 isn't the only 'correct' gamma. 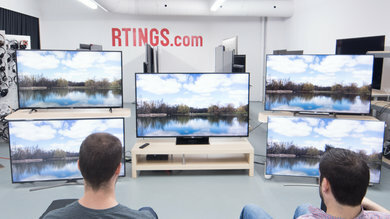 TVs typically have several gamma options available, usually ranging from 1.8 to 2.6. Our target of 2.2 is about in the middle, and appropriate for most setups. Apart from 2.2, a gamma of 2.4 is also appropriate for very dark rooms, and a gamma of 2.0 works pretty well for brighter ones. It’s best for most people to avoid the other options, as they will likely be too dark or light. 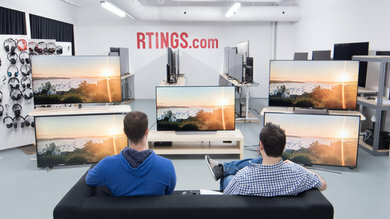 The ‘Color’ and ‘Tint’ settings on a TV are also used to adjust certain aspects of color, but they are nearly always correct by default, and so you should leave them be. We discuss this in a bit more detail here. 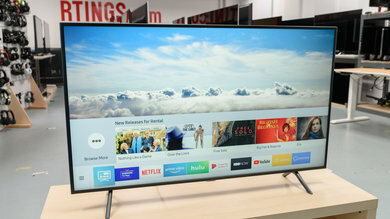 Some new TVs have a wide color gamut setting, which increases the number of colors your TV will try to display. While this is great for upcoming HDR media, it will make regular videos look oversaturated. For most of what you watch, this setting should be disabled, if available. We talk more about wide color gamuts here. The white balance and color settings we list on the settings pages of our reviews are not meant to be copied. 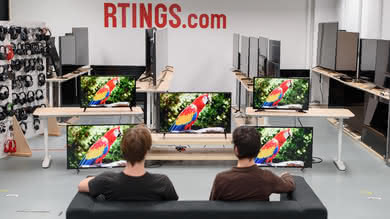 They are only guaranteed to work on our TV and might worsen the color accuracy of other units. If you do copy them and get bad results, reset them to the default settings. All of our post-calibration results come from the same ‘pass.’ This means that we finish entering settings before performing the final analysis with our spectrophotometer. All shades (and their gamma level) and tones result from the same set of adjustments – no cheating. We avoid extreme adjustments whenever possible. Ideally, the closer each individual adjustment is to zero, the better. Very high values (like +50 red offset, for example), can result in color banding. The white balance dE number represents an average of all shades, and so even if it means a slightly higher dE overall, we try to keep close shades looking relatively similar. For example, if the average dE is ‘.4’ (which we consider a pass), but this is a result of averaging out a dE of '2' from both 20% gray and 80% gray, we do not consider this an acceptable calibration, as the sharp jump between some shades (10% to 20%, or 80% to 90%, for example) will be jarring. Time, position on the screen, and the unit being tested will all change the results of white balance and color dE measurements. 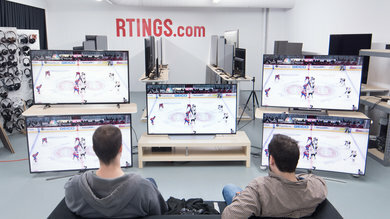 Even measuring the same place on the same TV, but on different days, could net significantly different results. For that reason, there is no need to worry about a small difference in values. Color accuracy is an expression of how well a TV can display colors, shades of gray, and shadows in a picture. It’s important for all the video you will watch, though it’s usually only big deviations from the ideal that are going to be noticeable by most. 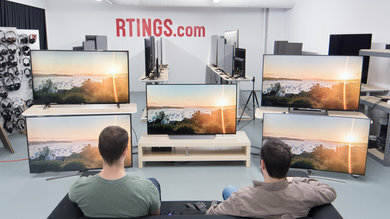 To evaluate a TV for its color accuracy, we measure the white balance dE, color dE, and gamma, which gives us a good overall picture of how accurate a TV is. 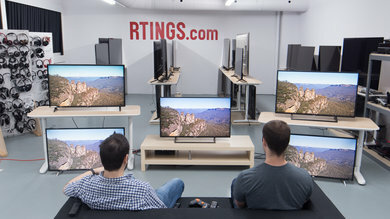 We do this once with just a couple of settings tweaks to the TV, and once after a full-color calibration. 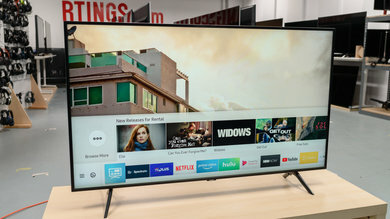 Luckily, most TVs have pretty decent color accuracy with just a couple of settings tweaks, and most people will only notice problems with color reproduction when the accuracy is really far off from ideal. 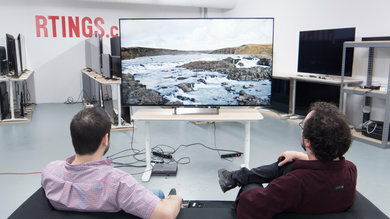 For that reason, as long as you get yourself a TV that has pretty good pre-calibration color accuracy, you’ll be all set to enjoy your TV. 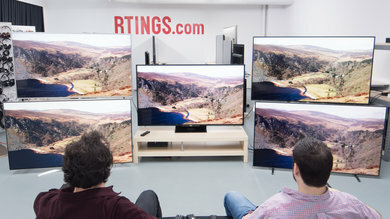 A full-color calibration is also an option for getting good color accuracy, though most people are unlikely to notice the benefits of this over just choosing good picture settings, so we don’t recommend getting one done.